WASHINGTON — Planet, Spire, BlackSky Global, Kepler Communications and several other startups made progress deploying constellations of communications and remote-sensing satellites last night thanks to the launch of an Indian Polar Satellite Launch Vehicle. The 380-kilogram HysIS satellite separated from the rocket in low Earth orbit roughly 17 minutes after liftoff. Smaller payloads from eight countries deployed into LEO over the next 92 minutes. Earth-observation company Planet had the most satellites on the PSLV mission, launching 16 Dove cubesats under the name Flock-3R. Those satellites join Planet’s fleet of more than 100 optical-imaging satellites. Spire, a company that provides weather, ship-tracking and aircraft-tracking information from space, had the next highest passenger count with four Lemur cubesats onboard. The European Space Agency co-funded two of the four satellites through its Advanced Research in Telecommunications Systems division to further improve the gathering of weather data from satellite navigation signals as they pass through the atmosphere, a process referred to as GNSS-RO. In a statement, Spire CEO Peter Platzer said the company now has more than 60 satellites in orbit. “This work with ESA helps further support the global development of commercial aerospace’s potential to make space access universal,” he said. Planet and Spire are the two largest cubesat constellation operators in the world, with Planet counting for almost half of all satellites between 1 and 50 kilograms that launched last year. BlackSky Global launched Global-1, its first operational satellite of an envisioned 60-satellite constellation for global, high-resolution imagery of the Earth. The company launched a demonstration mission called Pathfinder-1 in 2016. BlackSky Global has another satellite, Global-2, launching Dec. 2 on SpaceX’s upcoming SmallSat Express mission, and two more in the first quarter of next year: Global-3 on another PSLV and Global-4 on a Rocket Lab Electron. Kepler Communications, Fleet, and Hiber, three startups targeting the Internet of Things market, each launched cubesats for their constellations. The launch carried Hiber’s first satellite, Kepler’s second and the third for Fleet. Dutch startup Hiber, formerly Magnitude Space, plans a constellation of dozens of small satellites and partnered with Iridium last year to serve different types of IoT customers. Australian startup Fleet plans to operate up to 100 satellites and Kepler up to 140 satellites. Additional payloads include Harris Corp.’s HSAT-1 technology demonstration mission, Geooptic’s Cicero-8 weather satellite and Reaktor Space Lab’s experimental miniaturized infrared hyperspectral imaging satellite, Reaktor Hello World. 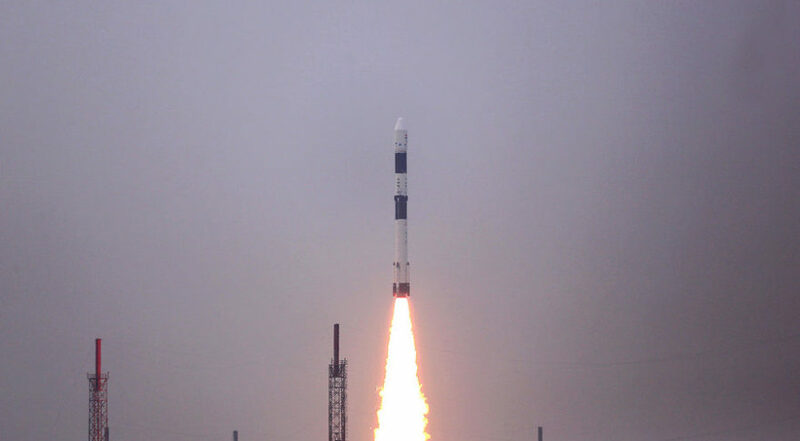 The PSLV launch also carried Innosat-2 from Malaysia, Facsat from Colombia and 3CAT-1 from Spain. The launch was ISRO’s fourth PSLV launch of the year and sixth overall launch for 2018.